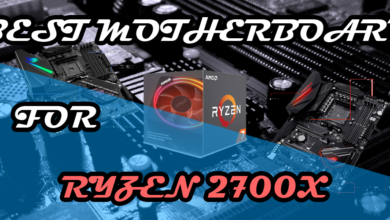 When we talk about graphics cards, we get very excited because they are our favourite computer component but when peripherals like mouse and keyboard are mentioned in front of us, sometimes we don’t pay any attention. I don’t blame anyone for this but if you are here to get the best gaming keyboard under $100, then you definitely want to take your gaming experience to the next level by enjoying the games not just by watching the animation going on your monitor but also want to feel the games with your hands. I spent a lot of years playing with a simple keyboard mouse combo and this was my fault but for the past few years I have been using mechanical keyboards for the same and there is a huge difference between a normal keyboard and a gaming/mechanical keyboard. You feel great in pressing the keys, watching the LEDs glow and these keyboards are appealing to your eyes. Not only that, they are actually more reliable and work for years. This is why you should get one gaming/mechanical keyboard for yourself otherwise you are ruining the gaming experience completely. But don’t worry, I have just compiled the list of the top 9 gaming keyboards that cost under $100 with the latest keyboards available on the market. I have arranged the keyboards in sequence according to the price. You will find the cheapest keyboard at the top and the more expensive one at the bottom which will be close to $100. Take your time to read the brief reviews of each and make up your mind. Also, don’t feel any shame in asking any question in the comments section. It’s my job to answer your questions. 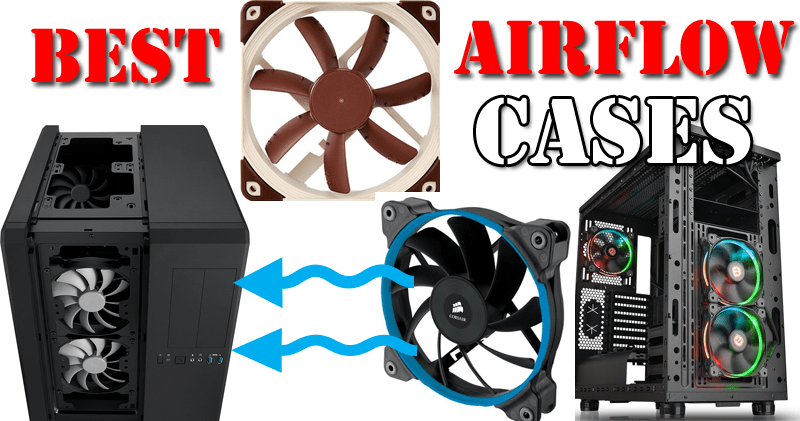 EagleTec is a small company as compared to the big brands like Corsair, Cooler Master or Razer but this makes it a good competitor at a lower price. It has made a great mechanical keyboard for a price less than 50 bucks which is impossible to find with a big brand. So, for people who don’t have that much money and still want to get the feel of mechanical keys, here is the ultimate option which is used by millions of people and has got more than 1000 positive reviews. The body of this keyboard is made up of Aircraft Silver grade aluminium with white ABS construction. In other words, the top of the keyboard has an aluminium body and the rest of the keyboard is having a white plastic body that is made up of good quality plastic. This makes it look very appealing just like a brushed aluminium body having reliability and strength. I am very happy that a company has done such a good job at a cheap price that makes it affordable to a lot of gamers out there wanting to get aesthetics as well as performance. It uses custom mechanical switches which are different from the Cherry MX switches found on high-end keyboards but these are also good for the entry-level work. You will get the blue switches on this keyboard that makes a clicky sound. As this is a mechanical keyboard, it is equipped with the Anti-Ghosting feature which is very important for gamers. You will be able to press multiple keys at the same time with all of the keys registered which is not present in a membrane keyboard. As for the quality of the keycaps, they are also good, not of the best quality but these keycaps also provide a spill-resistance feature which will prevent the average spill of water entering the keyboard. 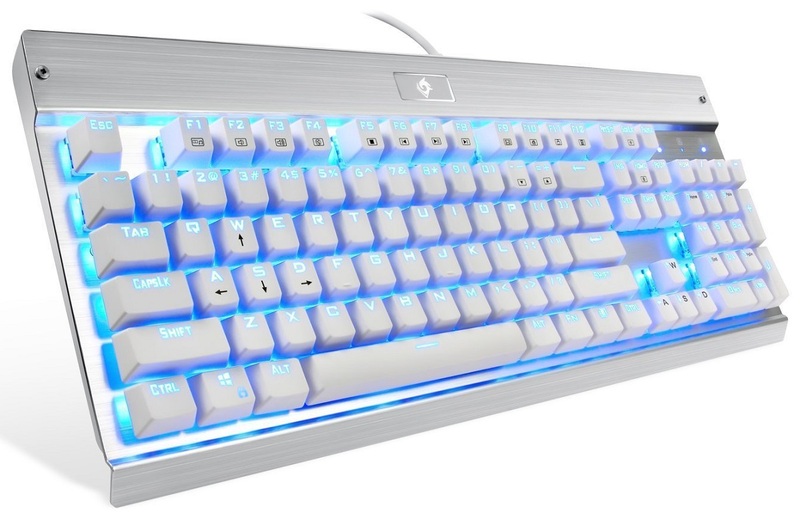 The LED used in the keyboard is blue and with the combination of white keycaps it feels very comfortable and provides a very bright theme overall. And in case you want RGB lighting, then you are fortunate enough because it has several versions with different LED lighting effects such as Static, Rainbow, RGB. 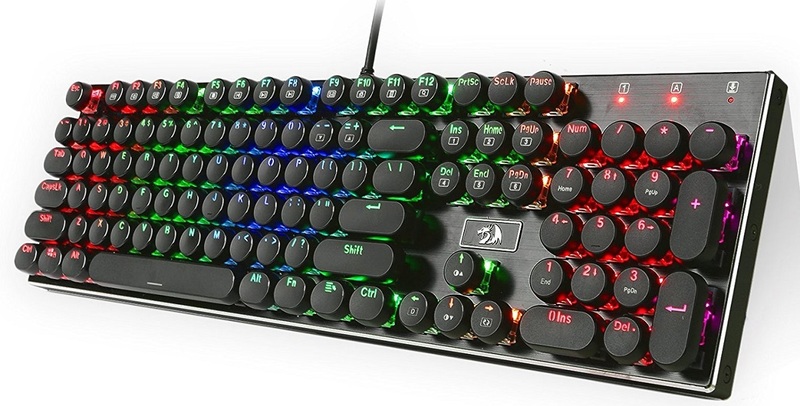 The RGB version of this keyboard is available for $50 in case you don’t like a single colour LED backlighting. If you have never used a mechanical keyboard in the past and want to start with something cheap and good, then just go with this one and you won’t be disappointed. 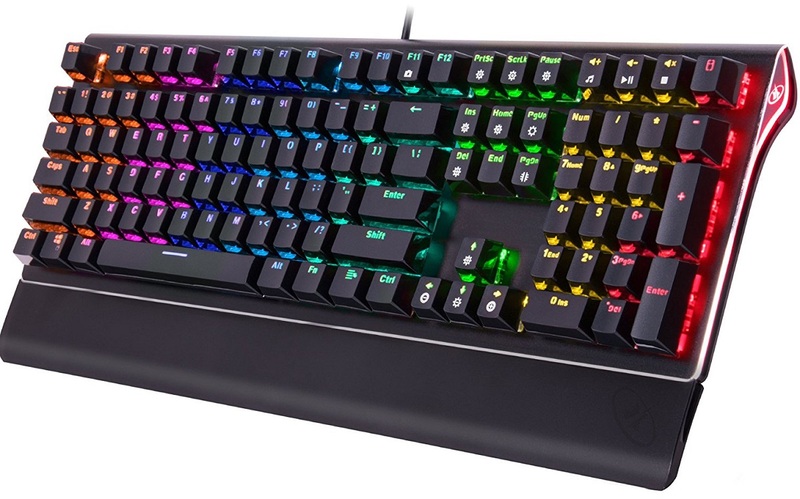 This one costs the same as the EagleTec KG011 but packs RGB lighting which adds more to its aesthetics. 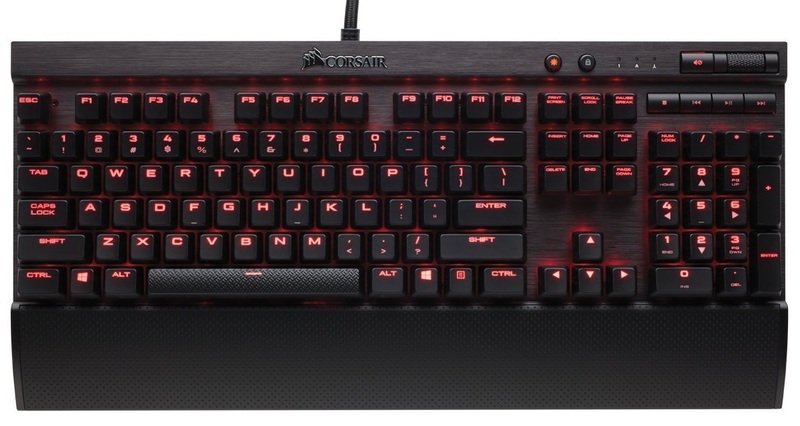 Obviously, there are some limitations as well as advantages of this over the KG011 but for mere $40 this keyboard is a good starter for budget gamers. From the name, you would think that it’s a proper mechanical keyboard but it’s actually not. It’s a membrane mechanical feel keyboard that uses membrane keys but feels like mechanical. It’s simply not possible to get everything at $40 but at least its cheaper than some of the membrane keyboards that come from bigger brands and for getting started you don’t really need to get a huge branded keyboard. As for its features, it comes with hybrid mem-chanical key switches that provide a clicky feel and come with a 19-key Anti-Ghosting feature. Which means that you can simultaneously press 19 different keys together and they all will get registered. So, you will have upper hand on the basic membrane keyboards. Games like Tekken where You need to press several different keys at the same time will let you take full advantage of this feature. As for its body, it is made up of plastic and doesn’t feature very premium body but it’s surely enough reliable. Anyways you are not going to play baseball with it. The keyboard weighs around 2.39 LBS and comes with a detachable wrist rest which is a very good addition to it. Only high-end mechanical keyboards come with this feature and for mere $40, Rosewill has provided a very good value for the price you pay. 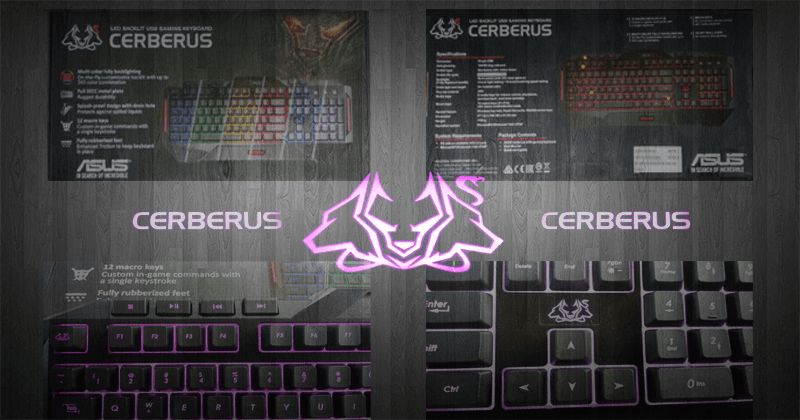 For enjoying its aesthetics, you will have 8 RGB lighting effects that you can customize with the number keys. Those are Rainbow 1, Rainbow 2, Breathing, Wave, Static, Spectrum, Personalize and Ripple, all are accessible by number keys from 1 to 8. This keyboard is also available in white colour if you want to match your setup theme if it’s different than black. Overall, a very decent keyboard for 40 bucks. 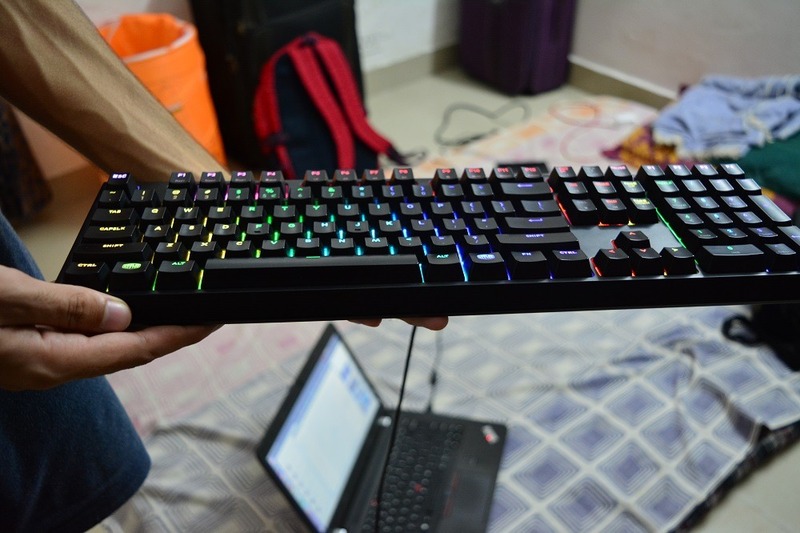 Rottay RGB mechanical keyboard is the ultimate budget keyboard which has literally all those features which you want. From RGB lighting to tactile feel. It comes with brown mechanical switches that are not noisy as blue switches and are faster in typing. Still, they make you feel very good when pressing the keys. These switches are made so durable that each switch can operate up to 50 million keystrokes making it an excellent choice for reliability. The body of the keyboard is made up of double layer ABS plastic body that is very strong with the finish of brushed aluminium at the top to make it clean and attractive from outwards. This is what I personally like in a keyboard. It should be tough and attractive from the outside and this keyboard comes with this feature. The keys are also made in a concave design which won’t let your fingers slip easily from the keys you are pressing. This keyboard is however present in only one colour: White. There is no other alternative like black or blue etc. So, it will get dirty more than the black ones. As for its aesthetics, it comes with RGB lighting having 16.8 million colours that are customizable according to your wish. There are 13 Dynamic backlighting modes which can be activated by pressing Fn+Ins, 9 sets of lighting colours which can be activated by pressing Fn+Del and 5 sets of lighting modes which can be activated by pressing Fn+1~5. So, it’s a pretty impressive keyboard for 60 bucks that has so much customizability which we haven’t seen in the above-mentioned keyboards. Its other great features include Anti-Ghosting technology with 104 key rollover which will ensure that when you press several keys at the same time they all will be registered. 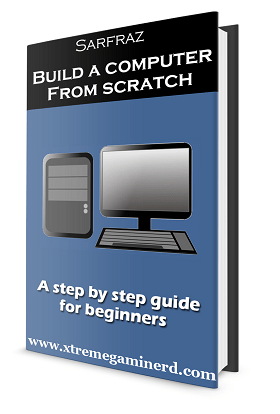 Even if you press each and every key on it, they all will be registered without any conflict. It’s a must feature for every mechanical keyboard and you won’t regret this one because I don’t find any big CON in it except the availability in one colour. When you want more portability and better compatibility then what can be better than the Drevo Calibur mechanical keyboard which sports Bluetooth as well as wired USB connection connectivity. If you want to work wirelessly for several hours or want to take it to other places with your laptop then there is no better option than this one for 60 bucks. And if you feel that your battery is draining, just connect it through the USB cable and you are good to go. This keyboard is ultimately for those who have compact space or for those who don’t want their keyboards to take a lot of space on their desks. It’s comprised of 71 keys as compared to the 104 keys on a normal keyboard and measures 16.3 x 4.6 x 1.7 inches in dimensions. This keyboard uses Brown mechanical switches that should give you a tactile feel with less noise as compared to blue switches but if you like pressing the keys with more pressure then there is Black switches option for you as well. The keyboard is also present in black colour if you don’t like white and both of these versions have RGB backlighting with 7 different lighting effects such as Ripple, Wave, Aurora, Reactive etc. which will let you have the enjoyment of different effects. The keyboard uses an internal battery for wireless working and can work for 20 hours in just 2 hours charge which is almost a full day of continuous working. 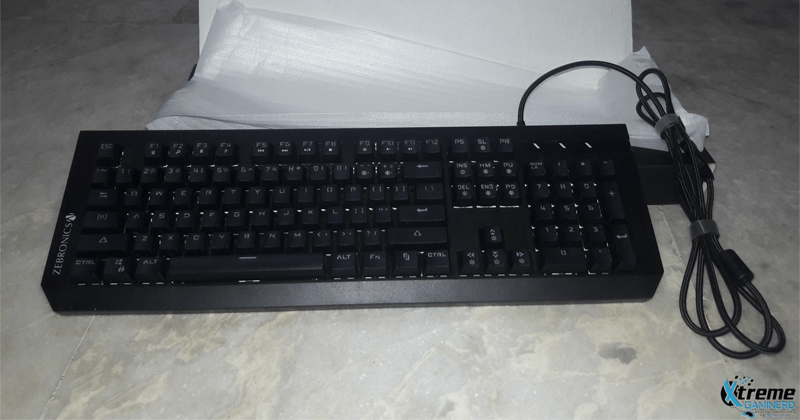 The keys and the body are well made especially the PBT keycaps which are found on premium keyboards and come with the Anti-Ghosting feature as well. The average working lifespan of each key is estimated to around 50 million presses which is far better than a membrane keyboard. So, I would suggest getting this one in case you want both your gaming as well as basic work done wherever you go. Whenever I see this keyboard I can’t take my eyes off of it. Redragon produces one of the best peripherals in the budget category and I have been using its products like Redragon K553 and M601 gaming mouse for more than a year now and I am not disappointed. This one is designed in a Retro Vintage style with round keycaps having a concave design that provides comfortability along with the Vintage look. This alone makes it stand out in the crowd and makes it easy to use as the spacing between the keys are enough for not letting you mistype. The body of this keyboard is made up of a metal which is very strong, unlike the plastic bodies which can be found in most of the keyboards. With vintage style, it comes with a good matte-finish texture which looks similar to a brushed aluminium finish and is also scratch free. The keyboard is spill proof and comes with 3 drain holes at the bottom of the keyboard that will help the water drain if it falls on the keyboard accidentally. It uses mechanical brown switches which are silent and have around 50 million keystrokes lifespan for each key. You can easily remove the keycaps with the help of a tool and can clean it. There are additional 8 switches that Redragon provides with it which you can replace in case if you encounter any fault. Aesthetically, it’s having RGB LED backlighting with 15 backlit modes and you can configure it with the help of FN key as in most keyboards. How much it costs? Below $70, a fair price for a distinguished look with a strong metal body. Razer is one of the best brands of peripherals and has dominated most of the brands in gaming mice, keyboards and headsets. The Razer Blackwidow ultimate is a popular mechanical keyboard that came in 2016. Razer has a famous Green colour Logo and therefore most of its products are having Green as a primary colour for lighting including their Razer Deathadder Elite. This one is also having its primary colour backlighting as Green but there is an RGB version too which is much more expensive than this one and doesn’t have the Numpad. Razer used Green switches for this keyboard and these are not Cherry MX or Kailh switches. They will although feel similar to the Cherry MX Blue switches in working with a good bump and loud click. Razer green switches are specific to Razer keyboards only, therefore, there are a few things you must know about them. The actuation point of Razer Green switches is 1.9mm as supposed to 2.2mm in case of Cherry MX Blue although both of them produce clicky sound but the Razer Green switches are a little smoother. Also, they have 80 million strokes life which is 30 million more. The body of BlackWidow Ultimate is made textured for scratch resistance and the keys are concave for good ergonomics. The keyboard features a 10 key roll-over anti-ghosting which is lower than modern mechanical keyboards because back then it was not needed that much. It’s still not a big thing because you have got 10 fingers, so you won’t be able to press more than that except if you use your palm. As for its backlighting, there are 6 effects you can choose from which are: Static, Breathe, Starlight, Ripple, Reactive and Wave. Well, this keyboard packs more features than what is apparent. There is a USB pass-through for better cable management and Audio-out/Mic-in Jacks are also present in it for easy access to your headset. There is also a Gaming mode option in it by which you can disable the Windows key to eliminate the risk of pressing it accidentally when you are in a game. A lot of keyboards have this feature nowadays but you can customize it according to your will and you can also disable the Alt-Tab and Alt-F4 with it. This keyboard will cost you $80 and will provide a good value. There is no doubt that among the top manufacturers of peripherals, SteelSeries is among them who has all types of mice, keyboards and headsets. The SteelSeries Apex M500 mechanical keyboard was launched in 2016 and until this day it’s very popular because it comes packed with good features with simplicity. 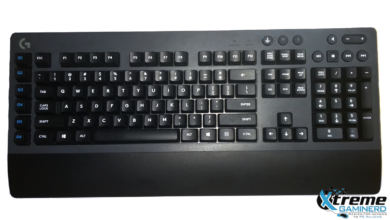 The keyboard features a black body with black keycaps made up of good quality plastic. Its backplate is made up of steel and the plastic body is very strong to withstand anything. 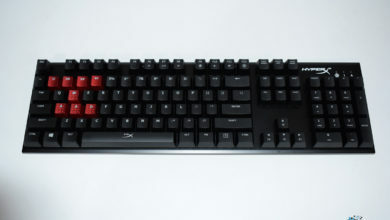 The keyboard uses Cherry MX Red switches and these are the among the best in the industry. No shadow of a doubt that the Cherry MX Red switches work flawlessly as I myself use a keyboard having these switches. The estimated lifespan of each key is 50 million keystrokes and you can program these keys with the SteelSeries Engine software. This software is an all-rounder that can let you manage all of your SteelSeries peripherals at one place. Now if you don’t know about the Red Switches from Cherry MX, then let me give you its brief introduction. These are silent switches which use very less force and don’t make the noise like the Blue Switches do. Also, they are very easy to press because their actuation point of working is 2mm although the keys can be pressed up to 4mm. The amount of force required is very less which is 45cN, therefore, these switches are very fast for typing work. The Apex M500 comes with 104 key rollover and 24 key Anti-Ghosting technology, a very common but needed thing in mechanical keyboards. The keyboard, however, lacks only in one thing. As it’s manufactured from a big brand, there is one limitation which is the backlighting. The keyboard comes with only one colour LED backlighting that is Blue unlike some of the keyboards I mentioned above which are RGB. Though you are getting genuine mechanical switches here which are better than anything. So, you have to compromise at one place and it should be a no problem for most of the people if performance and reliability is the priority. Anyways you can still customize the lighting effects of this keyboard from the software similar to the Razer keyboard I listed above it. 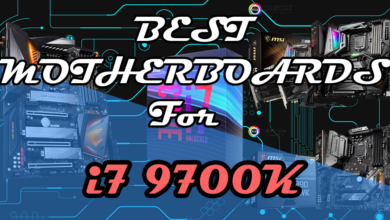 To explain the features of this motherboard a lot of things need to be mentioned which I will cover in brief as much as possible to put an overview. This keyboard is a beast with a sporty design which gamers would like over the simple plain mechanical keyboards. For some, plain design works good but for many, a sporty design is what makes their overall setup look perfect. Again, not only the aesthetics of this keyboard is badass but the actual material quality used in it is very superior. The body is made up of military grade brushed aluminium plate having a black anodized finish, The strength of this keyboard can make it suffer harsh conditions and therefore makes it very reliable. The keyboard also comes with additional features like mouse cable holder which will let you easily manage the cables of your keyboard or mouse. It also has a detachable wrist rest which will ease your working for continuous operation. Other features include a USB port and Audio, Mic jacks for easy access to headsets and USB devices. As for the main part, it has Cherry MX blue switches which are tactile switches with clicky feel. These keys make a clicky noise when you press them and require a little more force than the Red switches. 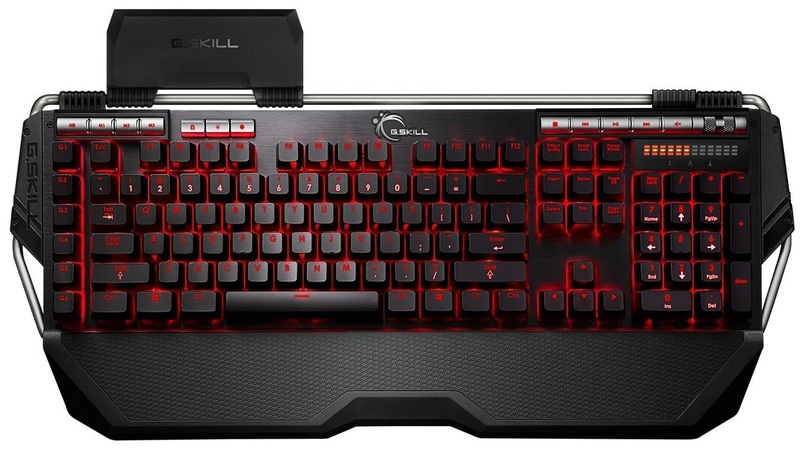 The average lifespan for each key is 50 million keystroke and each of the keys comes with individual backlight which you can customize with the G.Skill software. The Anti-Ghosting of this keyboard has N-Key rollover technology which means no matter how many keys you press, they all will be registered. Now when we take a look at its backlighting feature, it has only one colour: RED. The RGB version costs much more than $100. So, you have to settle with only one colour if you buy this. This keyboard also has several additional keys for taking the customization to next level. 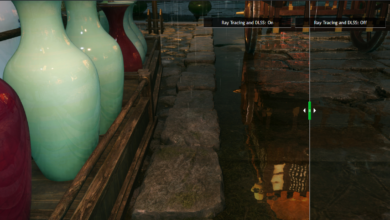 There are a total of 6 macro keys which can be used in different games where you need to press several keys at one time. This makes it difficult to correctly perform a move every time. Therefore, this is a good addition where you can enjoy the benefit of macro keys without making any other key to work instead of them. The keyboard also features multimedia keys at the top right side with a volume rollover and a LED display which indicates the volume value. At the left-hand top side, you have 3 dedicated keys for saving profiles which you can use for different games. Corsair is probably the best and also my favourite manufacturer of peripherals. I am using its gaming mouse and keyboard for a long time now and I can say without a shadow of a doubt that the material quality Corsair uses is superior among all, at least in my opinion. One of the most successful keyboards under $100 that Corsair has ever produced is the K70 Rapidfire which is solely made for fast-paced gaming. That’s why it has been given the name “Rapidfire”. The Cherry MX switches used in it are very sensitive and actuates at 1.2mm when pressed. These switches are Cherry MX Speed which is between Cherry MX Blue and Cherry MX Brown. These are neither too loud nor too silent but fast enough so that when you write a piece of article, you will do it quickly. Although the error rate will be a little high because when the keys don’t require much force, pressing them accidentally will register the keys. So, prepare yourself for accuracy. The body of this keyboard is made up of brushed aluminium from top giving it a scratch free look and comes with a wrist rest which is a must for this $100 keyboard. The keycaps are using high-quality plastic and you will get additional grey coloured keycaps for FPS and MOBA games. All of the keys use plain keycaps except the spacebar which uses textured one just like on Corsair K63 by which I wrote this whole article. There are also multi-media keys present at the top-right along with brightness and Windows Lock key. Most of the premium Corsair keyboards come with these additional keys. The keyboard features 100% anti-ghosting technology with N-Key rollover and comes with a USB port for USB devices. As for its backlighting, it provides you with only one colour: RED which has different lighting effects controlled by CUE software which can handle multiple Corsair devices at the same place. For $100, this is a good choice for those who want very fast performance and want to get their job done quickly. However, it’s very much prone to errors at the same time.